INTRODUCTION/OVERVIEW: "Tyrant: King of the Bosporus" is the fourth book in the extended Tyrant series and the second book in the series that follows Satyrus and Melitta the children of the heroes of the original Tyrant duology - series that now seems to be planned at four volumes, making for a total of six Tyrant books all together - that started in Funeral Games last year. The original series that comprises of two books, Tyrant and Tyrant: Storm of Arrows follows the adventures of Kineas, an Athenian nobleman and commander of Alexander's allied Greek cavalry until he and his comrades are politely but summarily dismissed after the final defeat of Darius at Gaugamela in 331 BC. Not welcome back in democratic Athens as both nobleman and "lackey of the Macedonians", Kineas is forced to find his fortune on the Black Sea as cavalry commander for the tyrant of Olbia; with a mixture of former and new comrades and allying himself with the Scythians Sakje, Kineas rises high in the Black Sea and contiguous steppes arena, though he is haunted by a prophecy about his final battle... And the Macedonians are coming both for the free Greek cities of the Black Sea in the West and to subdue the Scythians of the steppes in the East, so Kineas must face his former boss and idol, the Boy King and his Companions in battle. This duology while hemmed a little by the prophecy which made the last several hundred pages a bit too predictable starts like a good but "I've seen this before" one, only to explode into one of the most memorable books about the era of Alexander with great characters, atmosphere and take-no prisoners attitude. Highly recommended. Fast forward some 12-13 years later to 316 BC, seven years after Alexander's death when the fight for the pieces of his empire is intensifying and Tyrant: Funeral Games begins. Kineas' twin children with his Scythian warrior-princess wife are growing up with their mother who leads a mixed Greek-Scythian city founded by Kineas in the Black Sea hinterland. But when Eumeles, a former comrade of Kineas and now local bigwig, decides the three are a threat to his ambitions and brutally murders their mother Srayanka, the twins escape only due to the martial skills of their guardian, the Spartan warrior Philokles who was their father's best friend and companion. The story of Ptolemy's securing his rule in Egypt was also recounted in a slightly more fantastic setting in the wonderful Jo Graham novel Stealing Fire (FBC review). Before discussing why "King of the Bosporus" is another successful offering from the author, I would like to mention that Christian Cameron has started another wonderful series, this time about the turbulent era of the Persian Wars in the 490's-470's BC. The first volume published last fall, Killer of Men was another big time favorite which I have just missed reviewing here as I did with Funeral Games for that matter, but I plan to remedy this and review the sequel Marathon later this year when it will be published. ANALYSIS: What makes Christian's Cameron historical fiction set in the Classical World in general and this book in particular stand out? The first thing you notice when reading any Tyrant or Long War series book is the meticulous research and the pitch perfect atmosphere. No anachronisms here and also no "modern attitudes" from the characters which is one of my main turn-offs in the genre unless done extremely well in an ironical mode. The author's website linked above has a lot of "behind the scenes" information about the period in cause and how he chose this or that term, this or that scene and that adds considerable value too. The novels are also page turners and relatively free of infodumps, so the recreation in depth mentioned above is incorporated seamlessly in the narrative and in each of the 5 books to date, I found myself compelled to keep reading as much as time would allow once I opened the respective book. Getting down to the Satyrus and Melitta tetralogy and to King of Bosporus in particular, I would say that the main difference here is the youth and expectations of the main characters, though it is well tempered by the superb ensemble cast from the original duology as well as the new ones appearing here first. The twins are born to relative privilege and expectations - the Scythians have a strong matriarchal component, so Melitta like her mother Srayanka could and (of course later would) become a warrior too, heir on her own to the Sakje "crown", while Satyrus could claim his Greek heritage in the Black Sea cities. Brutally thrown out of their normal life in a mixed Greek-Scythian milieu and running for their lives as 13 year olds tends to shape one's character and I think that the author managed to show that very well. Satyrus alternates between overconfidence and insecurity, while Melitta tries to both emulate her mother's warrior heritage but also fit into the Greek world where "decent" women, especially of the upper classes, are expected to stay home, defer to men and run the household, rather than go and fight with bow and arrows on a trireme or on horseback and bed the men of their choice. It is true that their formative years in the "new life" are in Alexandria which at the time is a new city with less tradition than say Athens, but this "belonging and not belonging" at the same time is to me the main characteristic of the two main heroes of the tetralogy and shapes their actions to a large extent. Like Funeral Games, King of the Bosporus is also almost end to end action, on sea, on land, on the steppes with naval battles, sacked cities, brutal killings, pirates, cavalry action, but also intrigue, camaraderie and the expected touch of the fantastic in the classical world style of blurring the line between reality and the supernatural. Since this book has a lot of closure and in a sense concludes the main thread from Funeral Games, I am really curious where the series will go in the next two volumes announced for early 2012 and 2013, but King of the Bosporus (A+) is a book that fulfills the promise of the first volume and of the preceding duology in spades. 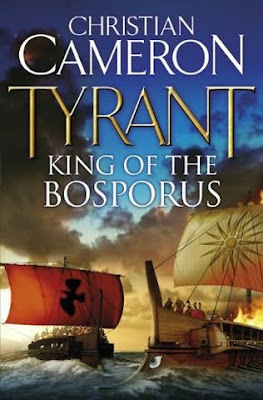 I'm glad you give a shout out to Christian Cameron as he is not well known despite his great historical fiction novels. I'm glad to see the series improve after Tyrant:Storm of Arrows as I felt that one was weaker after Tyrant since I felt the author painted himself into a corner with the prophesy of Kineas. Thanks for reminding me to catch up on this series! Thanks for the great review...I'll try and write to deserve such praise! I regretted that I could not review Funeral Games or Killer of Men at the time- both came out in periods when I had less time for full reviews and I bought both and this one for that matter, on publication and read asap - but as usual sff still gets the highest priority here as this being Fantasy Book Critic and all.